A Review of Mary Solberg's "A Church Undone"
Bonhoeffer the Assassin? Challenging the Myth, Recovering His Call the Peacemaking, by Mark Thiessen Nation, Anthony G. Siegrist, and Daniel P. Umbel. Foreword By Stanley Hauerwas. An intentionally controversial book, as the subtitle suggests, Bonhoeffer the Assassin? by Nation, Siegrist and Umbel is an attempt to challenge what the authors view as an unfortunate but pervasive myth; that by the end of his life Dietrich Bonhoeffer had retreated from his earlier held pacifist convictions in participating directly in plots to assassinate Adolf Hitler. As Bonhoeffer scholars from within the Mennonite tradition, and each deeply committed to pacifism, it could be assumed this book is another biased attempt by yet another group to hijack the Bonhoeffer legacy and turn him into an endorser of their own ideals. Though there is the uncomfortable suspicion of such a subjective vantage point, and some truth to it, the book does challenge long-assumed claims of a compromised Bonhoeffer with some measure of good reason and scholarship. Siegrist and Umbel are former students of Mark Nation and have each contributed two chapters in the second half of the book devoted to development of Bonhoeffer’s ethic. Nation begins the book himself with three biographical chapters providing a general orientation to the movements, associations and involvements of Bonhoeffer in the Church Struggle. Even more importantly this biographical section provides a closer look at what we actually know and do not know about Bonhoeffer’s time working for the Abwehr, and his remote connections to any conspiracies to stop Hitler, or assassinate him. The more ill-informed of Bonhoeffer fans today may think any and all working for the Abwehr were resisters however Nation documents that of the 13,000 who worked at the Abwehr, only fifty were known to be connected to the resistance, barely four percent (p. 74). And of the known forty-two separate plots to kill Hitler, only five could have had any possible connection to Bonhoeffer. In taking time to review those five, Nation documents that there were only two of which Bonhoeffer may have been even aware. Drawing from Dramm’s Bonhoeffer and the Resistance, anyone who includes Bonhoeffer in these efforts “greatly exaggerates Bonhoeffer’s role and importance in the resistance.” Nation says “I believe this is Dramm’s way of saying there is not a shred of evidence that Bonhoeffer was linked in any way to these attempts of Hitler’s life” (p. 86). Bonhoeffer is presented as a chaplain of sorts to the resistance, a spiritual advisor and pastoral counselor providing mental support, not so much moral support or justification (p. 82). In other words, he was in no way an assassin or even an accomplice of one. We are reminded his arrest was because of the role he played in the rescue of fourteen Jews, not because of any connection to assassination attempts. Regardless of the position one takes on the bias of this book, it importantly underscores the point that we are not as sure as we thought we were how directly Bonhoeffer was involved. For Nation, stunningly, Bethge is an unreliable source. Understandably, Green, who knew Bethge personally over several decades finds these insinuations outrageous. All that having been said, the first three chapters remain a generally informative and succinct, though a selective summary of the biographical unfolding of what transpired. The second half of the book offers an helpful overview of Bonhoeffer’s theological ethic and development. The thesis of the book is that from 1932-1945, Bonhoeffer held a consistent pacifist ethic and did not (as others suggest) repudiate Discipleship by the time he wrote Ethics. There is really no debate that in his 1929 Barcelona lectures, Bonhoeffer was solidly an advocate of just war theory. And there is no debate that around 1932, through his friendship at Union Seminary with Jean Lassarre – a French Tolstoyian pacifist committed to the simple obedience of the Sermon on the Mount – that Bonhoeffer’s thinking on the matter dramatically changed and was the catalyst behind the later writing ofDiscipleship. The claim of this book is that between Discipleship (1937) and Ethics(1943) there is no repudiation of a strong pacifist ethic for Dietrich Bonhoeffer. This rather than being a repudiation of Discipleship either in its parts or as a whole, Ethics is a confirmation, as it is its continuation, amendment, clarification and culmination (p. 158). The four chapters in the second section of the book hit the major themes we find in Discipleship and Ethics; cheap grace, simple and paradoxical obedience, the ultimate and penultimate, the this-worldliness of Christianity and, guilt and responsibility. The analysis of the writings of Bonhoeffer show “that Bonhoeffer in no way checked his rigorous ethics at the door of World War II or his involvement in the resistance. Bonhoeffer held to an ethic centered on Christ– uncompromised, though not unaffected, by his circumstances” (p. 209). Readers are encouraged to consider how, to date, Bonhoeffer’s development of thought has been viewed primarily through a Niebuhrian-tainted lens in that loving enemies is an impossibility– “unrealistic and, in a vicious world, is even harmful” (p. 218). The contention is this, in part, is what has been driving significant misreadings of Bonhoeffer’s later work. 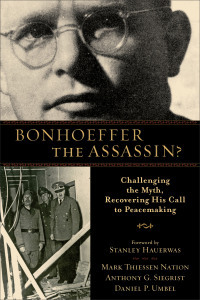 Book titles are intended to be catchy and provocative enough to sell books and start conversations but one wonders how Bonhoeffer would react to the use of the term assassin here in the title? Perhaps this important book might be better titledA Pacifist Rereading of Bonhoeffer or A Pacifists Guide to Bonhoeffer. In his conclusion Nation recites Larry Rasmussen’s standard work on the subject, Dietrich Bonhoeffer: Reality and Resistance, to bolster his own thesis: “All the twisting possible cannot make the author of The Cost of Discipleship a volunteer for even assassinating Adolf Hitler” (p. 222).